Did you know that ASO and Paid UA go hand in hand? There are nearly 6 million apps in both Google Play and App Store combined, according to Statista. That means there’s a huge number of competitors out there. 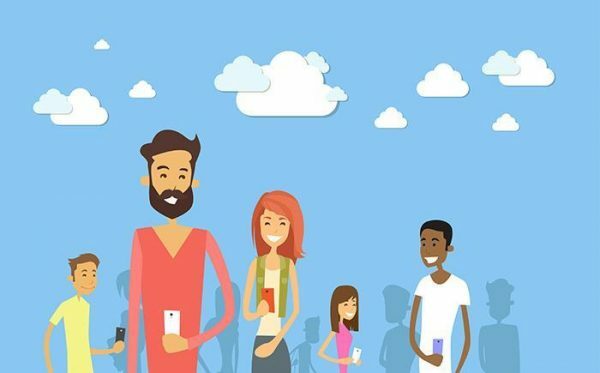 How can we stand out and get more traffic and downloads to our app? 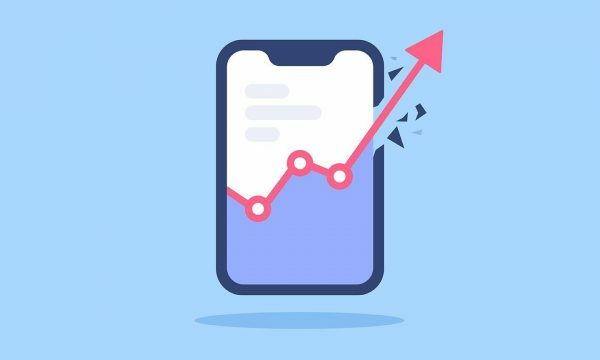 You may be thinking that you could run paid marketing campaigns, but the key is to combine Paid UA with organic user acquisition through ASO (App Store Optimization). Today we are going to share some tips on how to combine both strategies in order to make the most of them and get the better results possible. That is, more downloads, more users and more business. Mobile accounts for almost 70% of all digital advertising this year, as reported by eMarketer, and their estimation is that mobile ad spend will pass TV as leading ad medium. Taking this information into account we can conclude that competition is fierce (very fierce) and costs will probably be high. Do some research to detect what are the keywords relevant to your app and could generate more downloads, and use them in the proper fields. The better the research and the optimization, the higher the visibility in the app stores. If you want further reading on ASO Keyword Research, don’t miss this post. Icon is crucial in terms of conversion. It needs to represent clearly the type and functions of the app and it has to stand out among the rest, so make it attractive to catch the eye of the user.It is a crucial ASO on-metadata factor in terms of Conversion Rate to visit. Feature Graphic takes a third of the screen and will be the first impression of your app or game in Google Play Store, it needs to be representative of what’s the app about. It is a crucial on-metadata factor related to Conversion Rate to Download. Screenshots are also really important for promote. Include in-app images and attractive graphics. They have a big impact in Conversion Rate to download on the App Store. Users are more likely to download after watching an appealing promo video for both stores. The App Name or Title is key to use the most of the characters possible including the leading (in terms of traffic and difficulty) and more relevant keywords. This is the most powerful on-metadata factor. Short Description complements the Title and lets you use up to 80 characters. Use keywords in this field. Subtitle allows to write 30 characters and you can add keywords here as well. Those keywords will rank on the App Store. Promo Text lets you use 170 characters that are important for Conversion Rate. The description is the field where we can write the most (4,000 characters) so try to include a large number of keywords and describe your app in the most attractive way possible. Keywords field from iOS apps is not public and lets us include the keywords for which we opt our app to rank for. Having a hard time planning ASO for Google Play Store and Apple App Store? You’ll find everything you need to know here! Ratings and reviews are crucial for user acquisition, as 4-5 star ratings with positive feedback will pull out a lot more users! Check out their importance for Conversion Rate and visibility. We should take into account that nowadays, as stated by comScore, millennials only pay attention to ads for 5 or 6 seconds. This fact, plus what we said before about the costs, makes it even more difficult to succeed in paid marketing campaigns. However, according to Adjust, throughout 2017 paid installs grew by almost 80%, and it represents an 11% increase in the ratio of paid/free installs. This means that organic installs are still the most popular option, but paid campaigns are paying off and gaining importance. It improves app store rankings if you target your audience successfully. One thing is certain: the more downloads you get through paid marketing campaigns, the more visibility you are going to gain. With organic actions and paid campaigns, we are going to get a better Conversion Rate to Download, and the combination of the two translates into lower costs for developers. Search Ads consists on placing online advertisements on search engine queries. 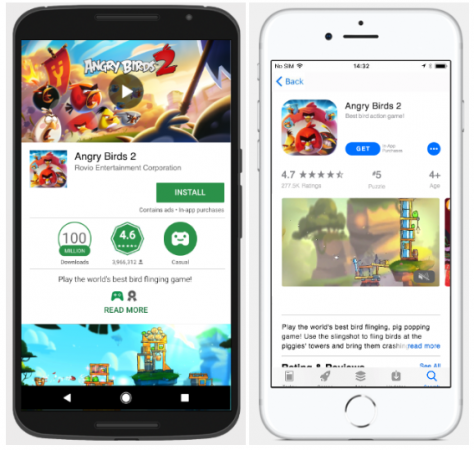 We can consider both Google Ads and Apple Search Ads to create and run ad campaigns on both Google Play Store and Apple App Store, respectively. Users see them when they research something using particular keywords. In terms of Social Ads, we are all familiar with Facebook Ads, Instagram Ads, Snapchat Ads or Twitter Ads. This channel is very useful for its wide audience, as around 72% of Internet users are Social Media users and 81% of businesses use Social Media. 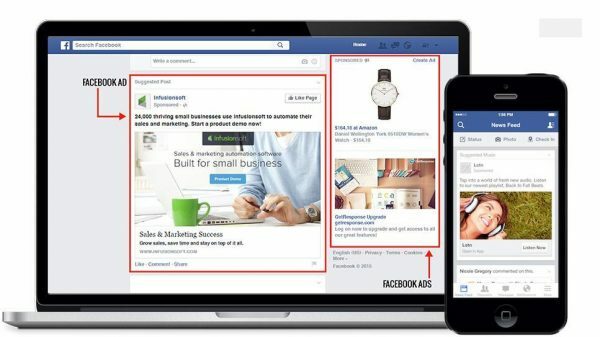 Facebook is the biggest social network in the world, so it is important to use it as a channel for your app promotion (Facebook Ads + Instagram Ads). However, other social media platforms can work great, so study your audience to run the best ad campaigns in suitable formats for a higher ROI. Mobile Display can be challenging but is increasing on digital spend. There are thousands of mobile ad networks! If you want to find out more about them, check this post out. 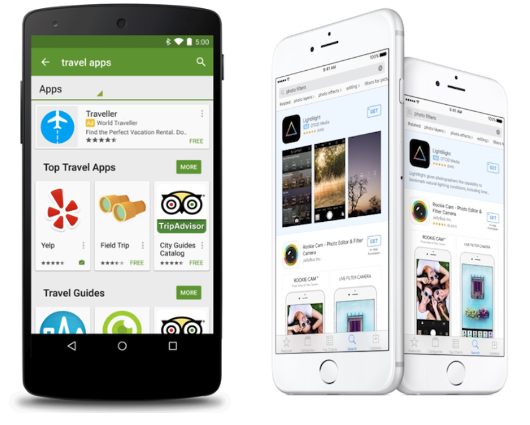 Banner advertising promotes your app by using a graphic (banner), which redirects the user to the advertiser’s app store listing / product page. 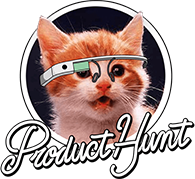 It helps the app get recognition and it may get more users to sign up or try the product. Native Ads work like natural content, blending into the space the user is browsing in. The most popular are interstitial ads, which are a full-page ad within the app designed similarly to the product in which it appears. Video Ads one of the most popular forms of ads, and it has been shown that a 30-seconds video has nearly a 90% completion rate. It works better to focus on storytelling and it can be placed on social networks (Facebook, Instagram), video platforms like YouTube and many other platforms. Mobile retargeting is the best strategy for user acquisition according to most of the marketers. It’s a campaign designed to retarget the audience that you already have, instead of the ones that never heard of your app. It consists on retargeting users that have already shown interest but haven’t completed conversion. Retaining these kinds of users is cheaper than targeting for new ones. 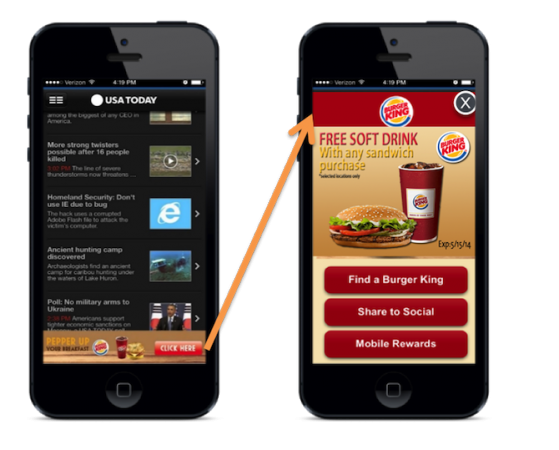 For further reading on mobile user acquisition strategies read this post! Optimizing an app’s ASO improves Conversion Rate to Download. This means that we will get more downloads with the same amount of visits. Therefore, ASO helps reducing costs of user acquisition through paid UA campaigns. On the other hand, investing on paid UA campaigns improves visibility for either apps or games on the app stores, as installs (and also its speed of download) are a really significant ASO off-metadata factor. There’s no magical solution to get a high number of users to download and use your app, but there sure are many strategies that we can use in order to improve UA. Remember that you should work on getting organic installs by optimising your app through ASO, and when we have made the most of it, the next step to follow is to invest in paid campaigns that will definitely help you get more visibility and Conversion Rate, to visit and download. This post was brought to you by Gerard Gordon from TheTool, performance-based mobile App Store Optimization (ASO) tool.